Email sales@hedgeye.com for access to this institutional call. Our veteran Restaurants analyst Howard Penney is hosting a deep-dive "Black Book" on his new Best Idea Short call on McDonald's (MCD). The call will be held this Friday, February 8th at 10:00am ET. Penney has a long history with McDonald's as both a Top Long and Short idea. He was among the first to go bullish on the name nearly four years ago, when sentiment troughed with the stock in the low $90s. For most of 2018, Howard was cautious-to-bearish on the name due to increasing menu complexity, slowing traffic, and disgruntled franchisees who were expected to make what turned out to be misguided investments. Penney's "Black Book" Call will present new data from the 4Q earnings call, and more information from the franchisee network, which did the unprecedented when they formed the National Owners Association last year. We think the company is making a mistake by downplaying the situation with franchisees. Operationally, it just gets worse from there for McDonald's. Penney will weigh in with his detailed insight on exactly why. He sees 20%+ downside for MCD from current levels. 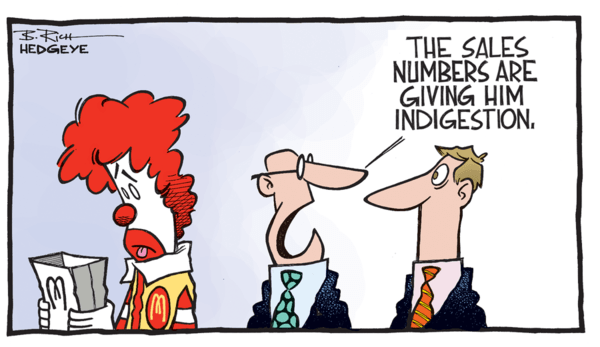 Email sales@hedgeye.com for access to our exclusive MCD Black Book.